﻿With the birth of my first daughter, I was born into a mother. This profound journey inspired my path of teaching yoga to mothers. From there, I became a birth activist and quickly knew that one day I would be supporting women in the rite of passage of birth. I am enjoying the slow incorporation of doula work into my services, which beautifully brings my yoga work full circle. I deeply understand the incredible, sometimes challenging, yet joyful transition through childbirth and into motherhood. Therefore, I strive to provide a safe, nurturing and empowering space for mothers to connect with their body and baby in preparation for the sacred and monumental transition of motherhood. Above all, I am a mama to my sweet, strong, spirited girls and partner to my loving husband. I have found my calling in teaching perinatal yoga and teach from my heart with respect for the intuitive wisdom within every mother and baby. 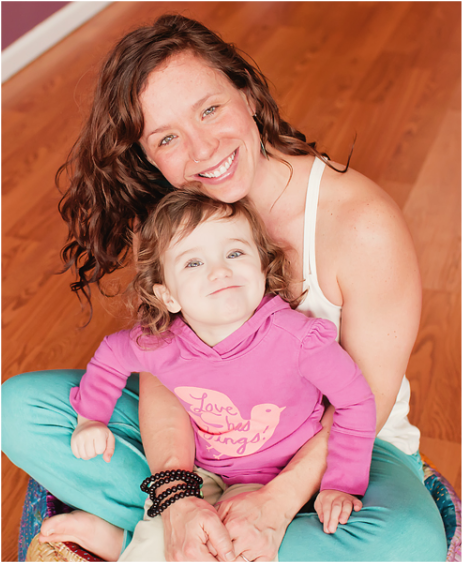 I find inspiration and joy in my teachers, the mamas I have the honor to share space with and my daughters - the best teachers of the yogini way of life. I am a Certified Prenatal Yoga Teacher through The Seattle Holistic Ce﻿nter, where I studied under the guidance of Colette Crawford. I am sincerely grateful to﻿ have trained, apprenticed and taught with Camille Mulchi of MotherWise Yoga in Portland OR. When designing my classes, I ﻿draw upon my experiences in pregnancy, birth, motherhood and yoga practice of more than 15 years, with five years of teaching. In addition to teaching prenatal yoga, I am a professional member of St. Lawrence County Birth Connection. Gratitude fills me daily to have found my dharma in sharing yoga with mothers. My greatest hope for my work is that I am able to offer mothers yogic tools for embracing a conscious and empowering pregnancy, birth and motherhood. I look forward to supporting families in the North Country with a full spectrum of services, rooted in yoga.